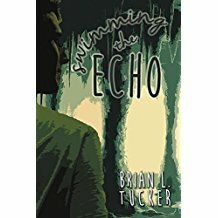 Star Line Books loves to have local writers in the shop, and Brian Tucker is no exception. A great friend of Star Line, Brian will be joining us in the shop for a reading and signing of his most recent novel, Swimming the Echo. Born in Monticello, KY, Brian is an immense talent, who has lived in the foothills of the Appalachians, Houston, and eastern North Carolina. His fiction has appeared in more than twenty publications. He is an alumnus of the Eastern Kentucky University Bluegrass Writers Studio and was a finalist for the Linda Bruckheimer Series in Kentucky Literature Award for his collection, Baptisms & Dogs. He currently lives in Chattanooga, TN with his wife, Leah. SWIMMING THE ECHO, was released May 30th by eLectio Publishing. It’s an adventure of a lifetime. When a summer job to explore Mammoth Cave lands in Cade Rainy’s lap, he doesn’t think twice. The teen from Southern Kentucky makes a break for it. But when he finds his dad is connected to a man working at Mammoth, Cade discovers there’s more to this trip than meets the eye. AND THE CAVE IS JUST THE START. Cade sets out to map the real route of twisted lies through fissures and stalactites, battling claustrophobia and bats. It’s Friday! Let’s read Wendell Berry!